Enjoy the wonder of having a bright beautiful blue morpho butterfly on display in your home without needing to hurt a living creature. Simply tap the jar to activate the blue butterfly's realistic movements. The number of taps will determine if your butterfly will fly, flutter or flap. The Glass Butterfly Jar measures approx. 17 cm x 9.5 cm x 9.5 cm and takes 3 x AAA batteries(Included). When awoken the eerily lifelike butterfly will move for approximately 90 seconds before going back into a battery saving slumber. 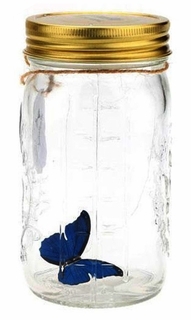 This high quality blue morpho butterfly jar makes a great gift and a perfect low maintenance pet.